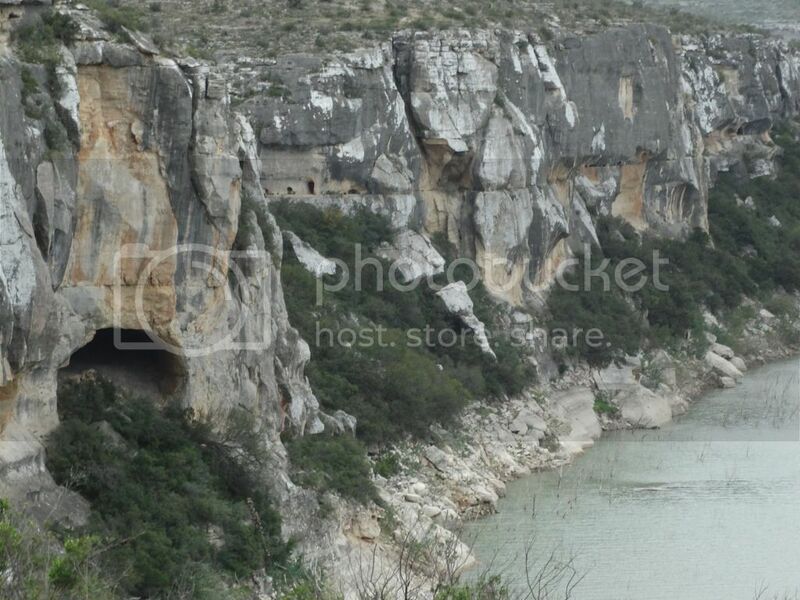 There's a beautiful giant cave along the Pecos River as you cross on Highway 90. I can see a road on Google maps that looks like it will get you down to the river bottom. Does anyone know can you access that cave from there? How far/long of a hike is it? I'd love to take my son into that cave coming back from Big Bend. I think that these people have tours of the area. I took this tour in December. The entrance (gated and locked) is just east of the Pecos bridge across highway 90 from the closed gas station with the collapsed roof. The Pecos bridge is visible from the site. One of the most well-photographed pictograph sites in the lower Pecos. On its walls is encapsulated the basic religious principles of the prehistoric inhabitants of the Lower Pecos region and the New World in general. The flight of the shaman to the land of spirits and his metaphorical death and rebirth are a message from the past about humanity's quest for solutions to life's mystery. Tour takes approximately 90 minutes. The White Shaman Site is a 250' descent into a narrow brushy canyon. It can be extremely hot and humid. The trail is steep with loose rocks and uneven footing. The roundtrip is approx. 1.5 miles—this is a strenuous hike. I think the White Shaman cave is on the east side of the river. The cave I see is on the west side, visible from the bridge. Both sides of the Pecos are in the Lake Amistad NRA (the NRA extends to approx 14 miles upstream from the bridge. The road you see on Google Earth (if it's the one I'm looking at that loops under the new bridge) is, I believe, the old highway from the time before the lake was impounded. While you might not be able to drive down it (although I don't see a gate on it), I'm pretty sure you could hike down it. For that matter, if you didn't mind a little bushwhacking, you could conceivable hike all the way out the point overlooking the confluence of the Pecos and Rio Grande. One caveat, although the NRA site map shows both sides of the Pecos as being part of the NRA, I can't tell if that's only shoreline to shoreline or if the NRA extends up the cliffs aways. It might do to check with "The Powers That Be" before finding yourself running afoul of an angry property owner. I think it's an old railroad tunnel. Yes, it is very likely to be an old railroad tunnel. I took a tour with our own Jim here with Lake Amistad's archeologist in a boat to photograph and visit Panther Cave and Parida Cave. The cliff edges are riddled with old train tunnels from a time when tourists would tour the canyon, years before it was flooded. Any cool pic's you can share? Yes, I actually have a few interactive panos, but I need to remember where I put them. I'll post a link. I'll find the original images and restore them. The cave I am referring to, although you can see it from the Hwy 90 bridge is actually not on the west bank like I thought, it's to the south of the bridge and on the east bank. Following some tips you guys gave me I corresponded with Greg Williams. He is the Executive Director of the "Rock Art Foundation" whose purpose is "to promote the conservation and study of the Native American Rock Art in the Lower Pecos region of Southwest Texas". He told me this cave is called the "Moorehead Cave". I'll quote what he said.. It was excavated by the Smithsonian in 1929-1930 with many of the artifacts taken to Washington. The cave probably only goes back about 50 feet or so, split into 2 rooms (shaped like an hourglass) with an opening to the top of the bluff in the 2nd room allowing light to enter the darkest area of the cave. The cave has an ash floor and was a significant habitation site for thousands of years. The ceiling and walls are soot covered with no traces of pictographs although they may have been there long ago." He said it is located on private property. FYI....I just found this link.